The truth is that very few if any other companies come close at all to the extensive number of features and fantastic functionality that these two companies provide with their email marketing services. However, we all want to get the best bang for our buck, and when it comes to something as important as our email lists, we want to make sure the choice we make is the right one for us. And when two companies are both so fantastic, making that choice can be hard. In this article, I’d like to explain some of the differences between Aweber and GetResponse, and help you decide which email marketing service is the best choice for you and your business. This article is going to cover a lot of information, so I’m going to break it down by features and explain how the two companies differ. At the end you’ll find a summary of all of the main points and my personal recommendation based on the information provided. First and foremost, one of the most important things you should be looking for when choosing an email marketing service is the successful delivery rate of the emails that company sends out. After all, if your emails are not even showing up in your subscriber’s email inboxes, everything else is moot. According to my research, both Aweber and GetResponse have very high delivery rates, both above 90%. Some bloggers have reported a slightly improved open rate after switching from Aweber to GetResponse, but there have been no solid case studies done to back this up. Unfortunately, I’ve only managed to stick with one of the two services long enough to do any large campaigns, so I do not have any personal data that can be used to back up these claims. One of the most important features of any email marketing service is the autoresponder. An autoresponder is a program that sends out emails automatically, often a series of emails in a specific order and frequency that you set. For example, if you were to sign up to my free 7-day traffic building course, my autoresponder would send you an email each day for the next 7 days. From there, all you have to do is create your email and publish it, and it will be added to your autoresponder sequence. Pretty simple! 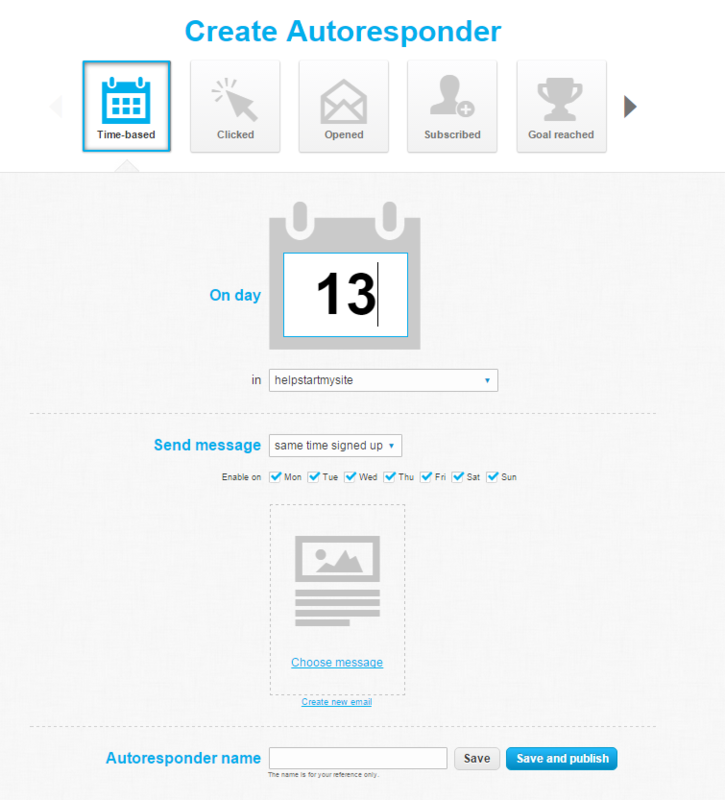 Aweber’s autoresponder is also fairly straightforward, but Aweber’s main drawback comes in its functionality. This is obviously a huge advantage over Aweber, and will only become increasingly important as your business grows and segmenting your lists become more of a priority. 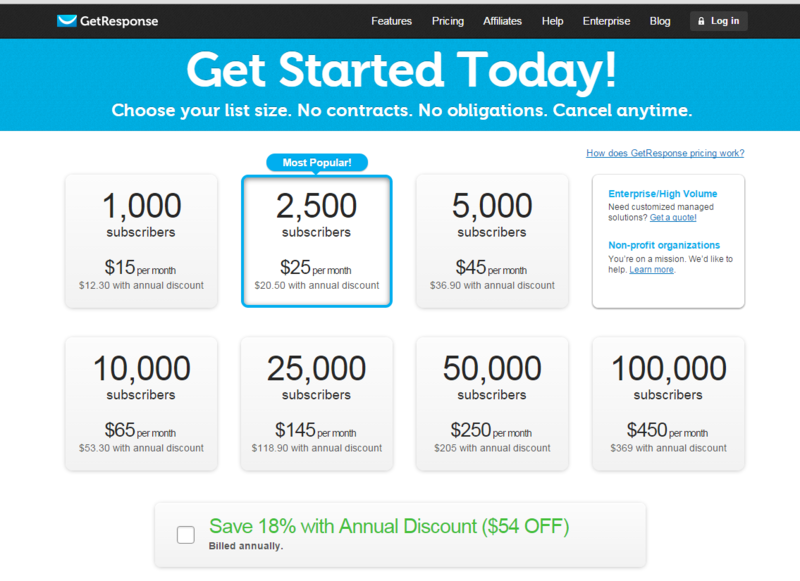 GetResponse also offers a bit more control over the subscribers currently going through your autoresponder series. For example, GetResponse has a button that tells you how many people have finished your autoresponder sequence, so you can move them to a new list or sequence if you’d like. Additionally, when adding new messages to your autoresponder, GetResponse will ask you if you’d like that email to be sent out to everyone who has completed your sequence. Aweber will just do it anyway without asking, which can be extremely awkward if you’re adding new messages somewhere in the middle of your sequence, for example. Winner: GetResponse, by a long shot. Both Aweber and GetResponse have a pretty straightforward creation process when it comes to actually setting up the messages. The drag-and-drop system is incredibly easy to use and doing simple things like formatting text can be done with the press of a few buttons. Both companies have a feature that allows you to send your emails at a specific time relative to the subscriber’s time zone. What this means is that if you want your email to land in your subscriber’s email inbox at 9 AM, you can turn this feature on and that’s when your email will be delivered, regardless of the time zone that person is living in. Pretty neat! Despite the similarities, GetResponse does have an edge over Aweber when it comes to sending messages in two major ways. First of all, GetResponse allows you to preview exactly what your email will look like on a multitude of devices, along with many different email clients as well. 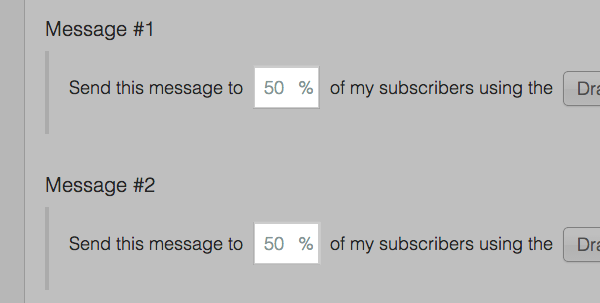 Secondly, GetResponse has far better split-testing options which we’ll talk about in a moment. Split testing is important to many aspects of our businesses, but this is especially true when it comes to sending emails. GetResponse’s split testing tool is really neat. 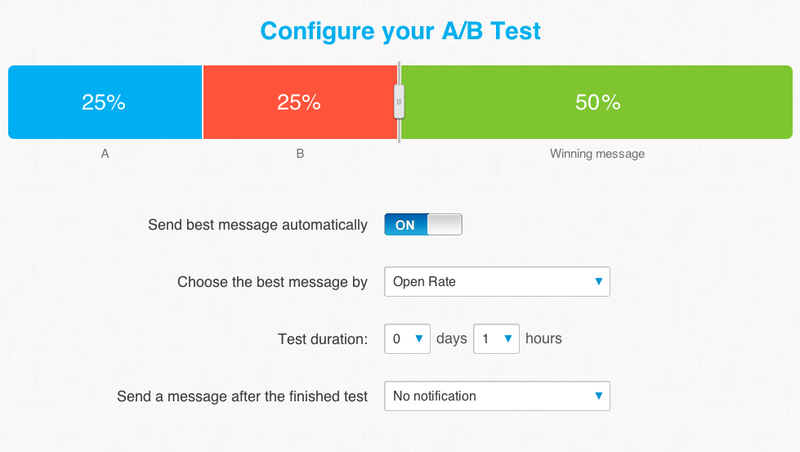 Simply turn on the A/B testing switch when creating your message and you’ll be able to split test everything from the subject line to the actual content of the message itself. But here’s the thing that makes GetResponse’s split testing feature so much better than Aweber’s. As you can see in the picture above, GetResponse allows you to send out your message to separate segments of your list, and then send out the winning message to the rest of your list after the test is over. This ensures the majority of your list only sees the message that ultimately ended up being better. When you’re working with huge lists of people, this can have drastically huge results in terms of click-throughs and conversions. Aweber also allows you to split test your emails and compare your results afterwards, but does not have the functionality to run the same type of tests GetResponse does. The difference between a good email marketer and a great email marketer often comes down to how closely they pay attention to their analytics, and how they use that data to improve their email marketing campaigns. GetResponse provides quite a bit of information to you, and allows you to quickly and easily view data about your total campaign in general or dive into specifics regarding specific emails. This data is laid out in a way that makes it quick and easy to get to what you need to see. 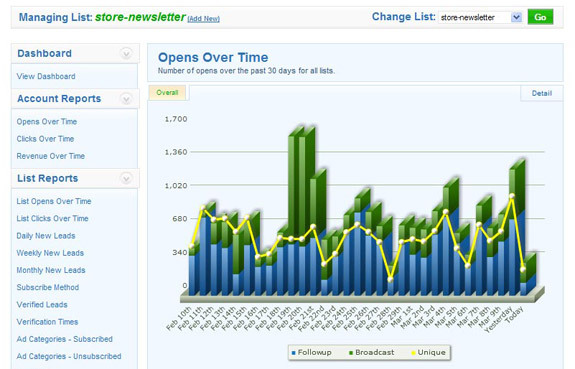 Aweber includes a bit more data in their analytics section, although it is a bit more difficult to read. They also lack the ability to email specific groups of people (such as those that opened but did not click-through an email you sent, for example) which is one of my favorite GetResponse features. Winner: Draw. Consider what’s more important to you, and you’ll know which company’s analytics platform will be better for you and your business. If you’re a blogger, you probably won’t be using templates all that often. Stick with good-old plain text and your emails will likely come off as far-less spammy and far-more personal. However, some people really like using templates anyway and you really can’t go wrong with either company. GetResponse has over 500 HTML templates in plenty of different categories, including art and entertainment, business, health, retail, sports, and more! 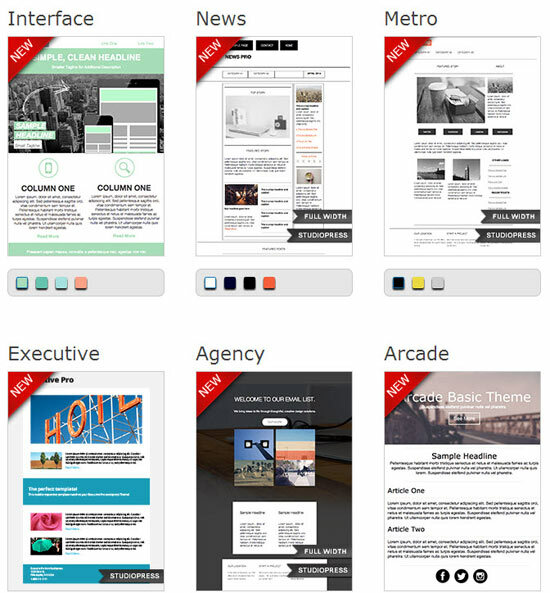 Regardless of the market you’re working in, there are plenty of customizable templates available for you to use. 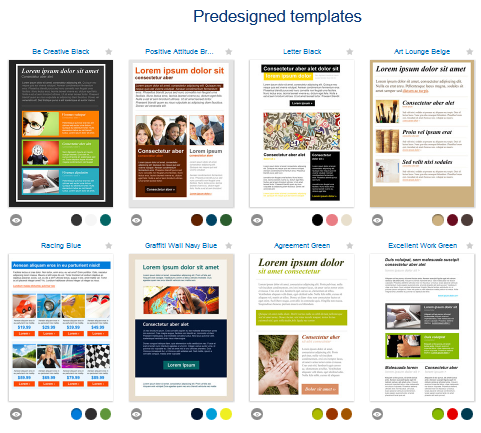 Aweber also has no shortage of customizable templates in various categories. One thing worth mentioning is that both Aweber and GetResponse both have responsive templates, meaning they’ll detect and change based on the device the email is being read on. This means the layout isn’t ruined when an email is read on a mobile phone or tablet, for example. Winner: Draw. 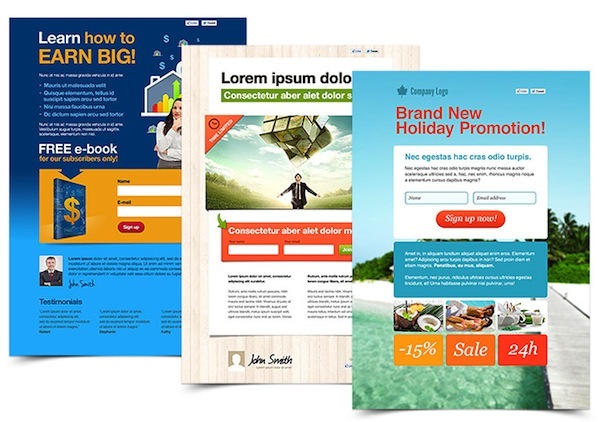 Neither company has any real advantage over the other in terms of email templates. GetResponse offers customizable landing / squeeze page templates for an extra $15 a month, and Aweber offers none at all. 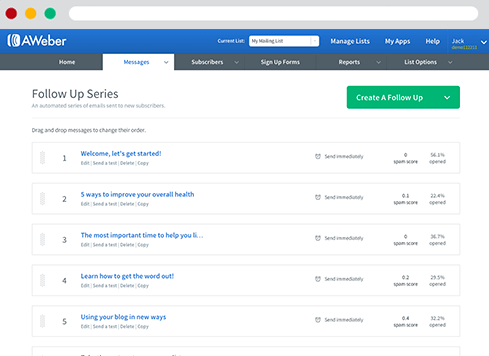 Personally, I think it’s a better idea to use something like LeadPages for creating your squeeze pages, but if you want something cheap and simple than GetResponse has plenty of landing pages for you to use. Aweber is currently ahead of GetResponse in terms of the number of products that support it, but I don’t expect this to be true for much longer. GetResponse is growing so quickly that any developer would be foolish not to add support for GetResponse. I highly recommend checking your individual products if integration is an issue for you, and requesting GetResponse support is added if it’s not already! Both Aweber and GetResponse have email, live chat, and phone options along with a knowledge base that will answer most questions. However, Aweber has phone support on weekends where GetResponse does not. As you can see, GetResponse is a few dollars cheaper per month for most packages, and the lowest pricing option will give you twice as many subscribers with GetResponse. That’s great, because by the time you need to upgrade, your list should be paying for itself anyway. In terms of trials, GetResponse wins here too because it requires no credit card. This means you can start using GetResponse right away simply by clicking here and signing up! While you can’t really go wrong with either Aweber or GetResponse, you still want to choose the best service possible for your business. Based on the criteria above, there is not really a better choice for most people than GetResponse. After using both Aweber and GetResponse extensively, I personally sided with GetResponse and have never looked back. Today, GetResponse is the email marketing service I use for all of my websites, and I have never had any reason to reconsider that. Do yourself a favor and sign up for GetResponse right now. I promise, you won’t be disappointed! If you have any questions about either Aweber or GetResponse, please let me know and I will do my best to answer your questions and help you make your decision. If you’ve already made your decision, I’d love to hear who you chose and why. Finally, if you have run into information that is outdated or inaccurate, please notify me right away and I will correct it as soon as possible. Thank you, and I look forward to hearing your thoughts! What an brilliant review you’ve got here. What an awesome coincidence, I’m also working on a review of these products on my blog which should go live later today. I agree with you that by considering most of the features of the two products, you’d just have to give it to GetResponse. Awesome, I’m going to have to check that out and see how your thoughts compare to mine. Really, I think both services are great choices that you can’t really go wrong with, but if I were starting out today I’d just have to choose GetResponse over Aweber. In the end it really is the better value. Good to talk to you Dan, hope to see you again soon! That’s a very helpful comparison article showing GetResponse vs Aweber. I have done a lot of chopping and changing of auto-responders, which is quite a pain to do. In the end I have chosen to stick with GetResponse – the feature that swung it for me was the “Time Travel” for sending out messages..
Hi Joy! It’s been a while huh? That has got to be rough. I played around with Aweber and GetResponse for a while before I ultimately sided with GetResponse and actually began building my list there, so didn’t have to deal with the migration process. I know its very easy to import your existing lists with GetResponse, so they have that going for them. I’m not sure how the process works with Aweber. Time travel is one of my favorite features. Aweber has something similar now too, don’t they? I’ll have to double check that. In any case, I am confident that GetResponse’s time travel feature has had huge effects on my open rates. Thanks for visiting Joy! Always nice to see you here. I have not been here for a couple of weeks. I’m glad I broke the silence on this one. Yeah, I think GetResponse is the winner. I did this comparative review some weeks back and there were reasons to give more points to it. Enstine Muki recently posted…WhatsApp your phone date is inaccurate ~ FIXED! Hey Enstine! Long time no see huh? It was a pretty close race because both services are so great but GetResponse is just simply better in a few key areas, so the scale has got to be tilted to them. Since permanently sticking with GetResponse I have never had any reason to go back to Aweber. I’d love to see the competition between these two companies heat up further, because that would mean us customers benefit more from all the new additions. GetResponse actually has come out with a lot of updates recently, so I know it’s going to continue to get better over time. Good to see you again Enstine! Hi James. It’s been a long time since I left a comment here! I remember when we discussed about Google+ and Authorship, which you thought was going to be essential to Internet success but I wasn’t convinced. Now Authorship is defunct. MailChimp was the first bulk email service I used because I didn’t have a credit card at the time to pay for AWeber, which was what all the coaches recommended. MailChimp seems to be quite popular in the corporate world, which is interesting, but I never liked it much. I use AWeber now and I admit I didn’t compare to others such as GetResponse because everyone seemed to recommend AWeber, so I’m surprised that GetResponse seems almost universally better and cheaper too. Perhaps they bought AWeber in the early days when it had weaker competition and they never re-assessed? Carlo recently posted…Is Your Audience Stealing Copies of Your Product? Hi Carlo! Wow! It has been a REALLY long time – you were one of the first people to ever leave a comment on my site and that was right around the time I started it. How have you been man? MailChimp is pretty popular for a free service but there are so many limitations and restrictions that it’s not even funny. As an internet marketer I wouldn’t touch it with a 10 foot pole. 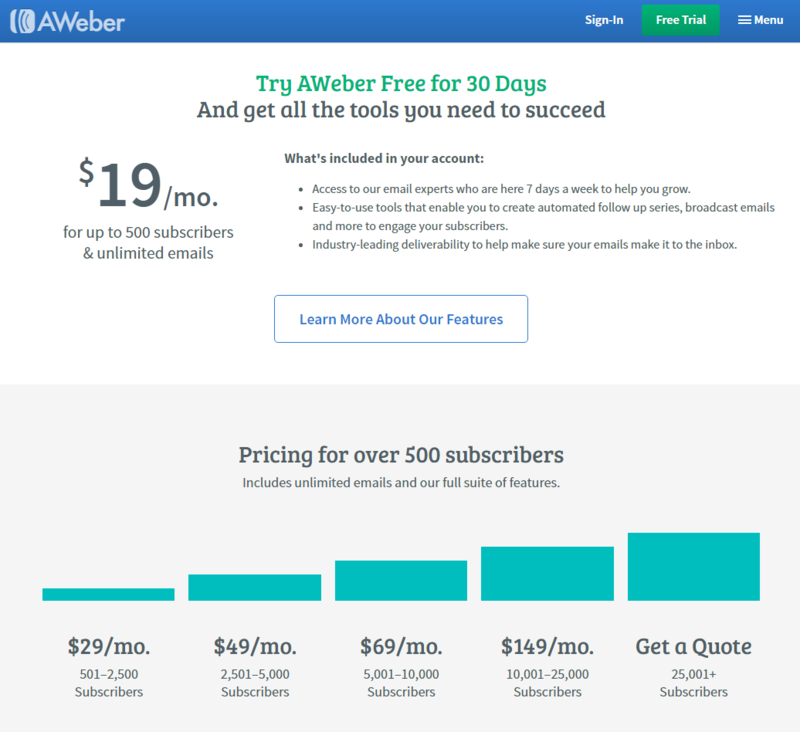 Aweber was #1 for an extremely long time, GetResponse has only fairly recently became a huge competitor and today I believe it has surpassed Aweber as the best affordable email marketing service. Not that there’s anything wrong with Aweber of course – if it suits your needs, that’s all that matters. However to anyone starting out today, I’m almost always going to recommend GetResponse for the reasons laid out in this article. Good to talk to you again, hope all has been well! Thanks for this, its great. I never really considered Get Response. I’ve tried Aweber, Mailchimp and COnstant Contact. My clients are nonprofits and most use CC. I’ve been planning to do an indepth review as well to get them to see what they are missing. I love AWeber for the technical features and MailChimp for the design features. I’ll have to take a look at GR to see if I can get them both in one product. PS – You may find it amusing that I was visiting AWeber headquarters and when I asked a question the designer went to the the Get Response knowledge base for the answer! I love AWeber as a company and for their tech features, but design is not their strength. Hi James, thanks for your great review. I’ve been a long term AWeber user but after reading your post I may switch in the near future. I do find AWeber a bit clunky to use sometimes, and I think their form creator software quite lame. Clearly if they want to keep up with companies like Get Response they need to lift their game. I am so much happy I am here finally after a very long time! I got your email and bro thanks for checking out on me, I really appreciate that! Wow! This review is awesome. You have provided every single detail to show how best the two work. I wrote a similar review few weeks back but mine was GetResponse vs MailChimp and I also gave it to GetResponse because it served the deal every blogger or internet marketer would want. Do have a wonderful day ahead my friend! Click Here To Check Out GetResponse! No need to wait any longer - sign up for GetResponse now!